When Dan Haren was traded to the Los Angeles Angels of Anaheim, many referenced the handy research from the Hardball Times which presented us with some data on the statistical effect of switching leagues if you’re a pitcher. In general, the move from the NL to the AL for a pitcher was expected to have a slight negative effect almost across the board including a deleterious effect on strikeouts, ERA, walks, and HR rate. What happened after the trade as you surely recall, was that his ERA dipped to 2.87 and his HR rate dropped almost by half, but his strikeouts fell pretty dramatically. This year, Haren is apparently out to prove he deserves “Mr. Outlier” as a nickname as he’s bucking the evidence that switching from the NL to the AL is universally a bad thing. Note that the two bars on the right are split 2010 – one in AZ, one in LAA. His K/9 rate during all three seasons with Oakland was exactly what he did in half a season in Anaheim (7.2 K/9), and there were more than one panicked owners thinking that the days of 200 strikeouts were long gone for Haren as he was turning into the AL-version of the Dan-Haren-Monster, which was still very good, but not what we saw in Arizona. Well, chalk it up to a small sample size, learning the AL-hitters, or insert excuse du jour, but his strikeouts are back. 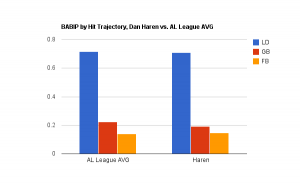 Haren’s HR/9 rate may have been impacted by his time in Arizona as it’s known as a more friendly place to create souvenirs, and particularly if you’re left handed, but despite the presence of the DH or any notion of more quality hitters in the AL, his home runs since the trade have come down dramatically. This year, they’re at downright silly levels. 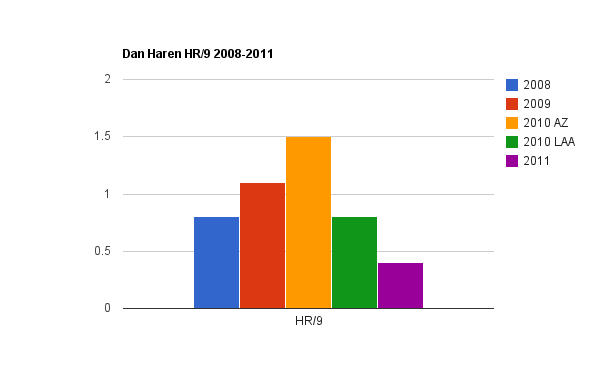 So Dan Haren is walking hardly anyone, a miser on HR’s, and striking batters out at a regular-Dan-Haren rate of 8.4 K/9. As you well know, his stats thus far are particularly awe-inspiring as he’s carrying a 1.93 ERA and a .84 WHIP. But there are indications that this is probably not sustainable, starting with his HR/FB rate which has gone from 11.7% to 10.8% down to 3.9% over the last three seasons. Haren’s career HR/9 rate is 10.5% and while pitching in Anaheim is certainly better for him than pitching in Arizona, you would have to expect that to normalize up towards an 8-9% rate, and it’s largely because of this that his xFIP currently stands at 2.83 (which is nothing to scoff at either). A big part of the reason his BABIP is so low right now is he’s just being stingy with line drives, which possess the greatest likelihood of dropping for a base hit. His career average LD% rate is 19.6% and he’s currently at 13.9%. So while he’s not getting particularly lucky in BABIP on line drives, he is doing a good job of simply preventing them. Overall, his pitch selection is pretty interesting and probably deserves a post of its own. His use of his fastball is down to 34.7% where he was throwing as many as half of his pitches as fastballs just three seasons ago. His fastball velocity is down right now, although not dramatically, at about -.8 mph. He has increasingly used his cutter over the past three seasons, and is currently throwing it 40.8% of the time, and it is his most valuable pitch, by far (in fact, among all qualified starters that throw cutters, it is the most valuable do date at 4.08 runs above average/100). He throws the cutter for a strike better than 70% of the time and still produces a whiff rate of about 14%. I recognize the Pitch f/x data reliability between fastball-types might render these findings a tad spurious, but as his fastball velocity started to wane a tad, he has increasingly moved to the cutter, and he has maintained his excellence. 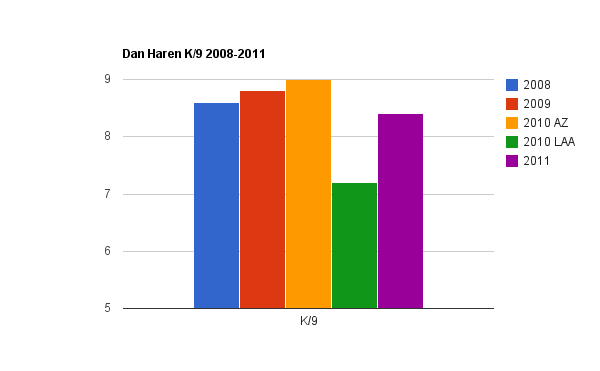 In sum, Dan Haren is good. Really, really good. Right now, he’s one of the best pitchers in baseball. He hasn’t gotten particularly lucky in any department save for his home run rate, which probably will normalize a bit. His BABIP is low, but may very well be sustainably low. ZiPS seems to believe Haren will start walking more batters and his BABIP will rise well above his career average, perhaps an AL-factor at play here. They predict a 3.50 ERA and 1.16 WHIP but they are buying the K/9 rate and predict 8.62 – so ZiPS may also have a second-half decline on their mind. Considering Haren put up a stronger, if not different, second half last year, I’m not prepared to say that a second half decline is certain, but even if Haren follows their prediction, it will still be one of the best seasons of his career. 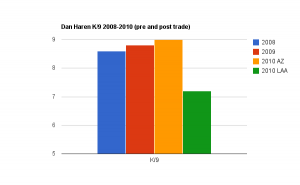 If you have a ridiculously deep starting staff, Haren does actually register on the radar of a sell-high candidate, but it better be for a pretty spectacular package, and you ought to be prepared to wince when you see his final line, because he may very well put up a sub 3.00 ERA, a WHIP barely north of 1 and strike out 215 batters. My bet is you could use that. We hoped you liked reading Dan Haren Likes American League Hitters by Michael Barr! Matt Joyce is a Choice Bargain? Michael was born in Massachusetts and grew up in the Seattle area but had nothing to do with the Heathcliff Slocumb trade although Boston fans are welcome to thank him. You can find him on twitter at @michaelcbarr. Don’t forget the Peter Bourjos effect on Dan Haren and Jered Weaver.